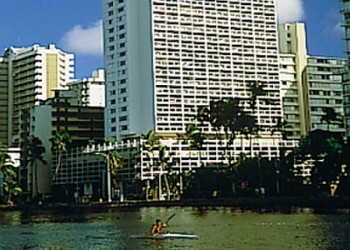 Aston at the Waikiki Banyan is a perfect family resort near the beach and all the fun of Waikiki. Moderately priced air-conditioned one-bedroom condominium suites can accommodate up to 5 persons and offer the comfort of separate bedrooms plus the convenience of complete kitchens. Pool, children's play area, sauna, snack bar, tennis and barbecue area. Aston at the Waikiki Banyan offers large one-bedroom condominium suites located only two blocks from the beach in the heart of Waikiki. A welcoming, beautiful open air lobby with a waterfall fishpond is graced with photos of "Old Hawaii" recalling the warm aloha heritage. All suites feature a fully-equipped kitchen and a large lanai. The Aston at the Waikiki Banyan is a family-friendly resort where every arriving child receives a personal welcome with a sand pail filled with surprises. All of the fun of Waikiki is only a few minutes walk away from the Aston at the Waikiki Banyan. One block from world-famous Waikiki Beach and lots of restaurants and shops within walking distance. Aston at the Waikiki Banyan is only two blocks from Waikiki Beach. This is a very beautiful and populated beach. You can enjoy swimming, sunning, snorkeling and other activities. There is also the availability of restaurants and hotels that are located beachfront.